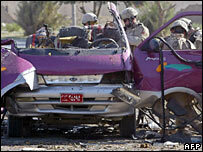 A suicide bomber blew himself up on a bus near the oil ministry in central Baghdad, killing at least 10 Iraqis. Reports say the blast, a few hundred metres from the ministry, also wounded 11 others. Earlier a suicide car bomb exploded in the east of Baghdad, killing a female bystander and wounding many. The attacker targeted a convoy of armoured vehicles used by private foreign security contractors travelling through the Karada district of Baghdad. Police investigating the blast near the oil ministry said the bomber boarded a small bus carrying students from a police academy. He detonated his explosives on Palestine Street, a main road close to the oil ministry. The bombing follows an attack on the oil minister, Ibrahim Bahr al-Uloum, earlier this week. He survived an assassination attempt when his convoy was attacked in Baghdad on Monday. Two of his bodyguards were killed. The attacks come a day after a bomb killed 25 people in Hilla, south of Baghdad, part of a wave of attacks in the build-up to the constitutional referendum next week. Amid the escalation of violence, Iraqis began picking up copies of the draft constitution that they will vote on next week. Following condemnation by the US and United Nations, the Iraqi National Assembly on Wednesday reversed its decision to change rules that would have made it harder for opponents to reject it. Whilst welcoming the change, Sunni Arab leaders warned that they may still call a boycott if the US continued its 'Iron Fist' offensive against insurgents near the Syrian border. The US military also launched Operation River Gate, involving 2,500 US and Iraqi troops, on Tuesday, targeting three towns along the Euphrates river. Insurgents have responded to the US offensive, and sought to influence the upcoming referendum, by targeting Iraqi Shia and Kurds. The bomb that destroyed a Shia mosque in Hilla killed 25 worshippers gathering for prayers on the first day of the holy month of Ramadan. Today, locals sifted through the remains of the mosque to try to ascertain whether the blast was caused by a car bomb or by explosives planted inside the mosque. 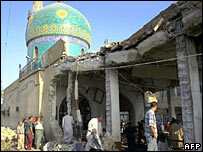 Although the mosque and its minaret remained standing, much of the roof collapsed following the blast.